Senior Alexis Shaw has spent her college career focused on improving the well-being of the people in her community and around the world. “I feel like we all have a responsibility to each other – to learn to serve others and to impact the world in the best way we can,” Shaw said. An international and global studies major, she comes from a long line of civic-minded individuals with a global focus. Her time in college has been spent volunteering with local organizations, canvassing for government officials and exploring new cultures, all while maintaining a 4.0 GPA as a member of the UNCG Lloyd International Honors College. Last year, when the Greensboro City Council formed the Greensboro College Commission as a way to engage students at all seven higher education institutions in Greensboro, Shaw was one of two students selected to represent UNCG. As a commission member, Shaw has been focused on improving community-police relations in Greensboro. 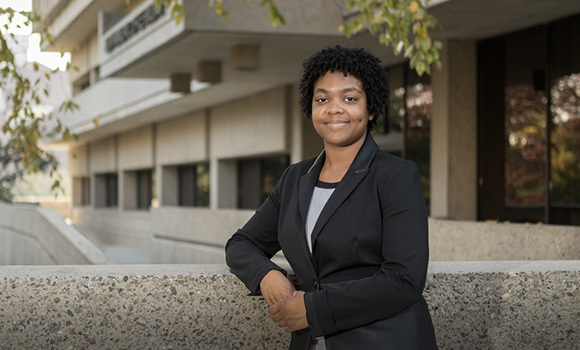 She has hosted forums between police and local college students, something she believes is helping build stronger relationships and understanding between the community and local law enforcement. In addition to representing UNCG on the commission, Shaw has served as a mentor for incoming honors students and as a volunteer with Church World Service, where she tutors individuals seeking to become naturalized citizens. This past summer, Shaw studied abroad in Moscow – another opportunity that has allowed her to interact with people from all over the world. As Shaw prepares for the next chapter of her life, she has some big decisions to make. There is a job waiting for her in Moscow, and she has already been accepted to graduate school. Participating in our social video contest (graduates only). Posting graduation photos, videos and well-wishes using #uncggrad. Following @uncg or #uncggrad for tweets during the Commencement ceremony on Dec. 15. Using our special Snapchat filters on the day of the event.